Low soil fertility is one of the major constraints to optimum crop growth and yield. Soils fertility can be managed by fertilization, but the grower must be fully aware of his nutrient problem(s) in order to arrive at the right decisions regarding the kind and rates of fertilizers to be applied. Numerous diagnostic techniques used in evaluating soil nutrient status and determining fertilizer requirement of the crop viz. nutrient deficiency symptoms, field and pot experiments, soil testing, and plant analysis. 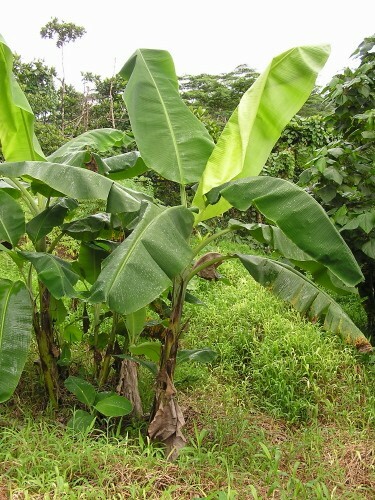 Banana yield and quality improvement due to balanced fertilization has been well documented. Information on improving fruit storage quality and the storage properties of banana fruit through proper nutrient use, is also crucial since large quantities of fruit are sold in remote markets. 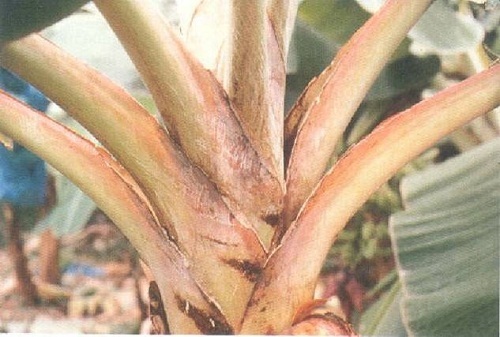 Banana root system spreads in the top 60 cm soil. Being an exhaustive crop, proper fertilizer application has to be resorted in order to obtain good yields. The choice of fertilizers, the dosage of nutrients, time of application etc., varies widely with respect to agro-climatic regions and varieties. Improvement in quality, in terms of physical and chemical characters, leading to high return to the growers. Synthesis of proteins (growth and yield). Cellular division and formation of energetic structures. Transport of sugars, stomata control, cofactor of many enzymes, reduces susceptibility to plant diseases. A major building block in cell walls, and reduces susceptibility to diseases. Synthesis of essential amino acids cystin and methionine. Central part of chlorophyll molecule. Necessary in the photosynthesis process. Formation of cell wall. Germination and elongation of pollen tube. Participates in the metabolism and transport of sugars. Influences in the metabolism of nitrogen and carbohydrates. Component of nitrate-reductase and nitrogenase enzymes. Nutritional deficiencies hinder the growth of banana plant (Table 6). It can be noted that potassium deficiency has marked negative effects. Function: Nitrogen is one of the primary nutrients absorbed by banana roots, preferably in form of the nitrate (NO3 -) ion. Nitrogen is a constituent of amino acids, amides, proteins, nucleic acids, nucleotides and coenzymes, hexosamines, etc. This nutrient is equally essential for good cell division, growth and respiration. Nitrogen is the chief promoter of growth. It induces the vegetative growth of the pseudostem and leaves giving them desirable healthy green color. A healthy robust vegetative frame is an essential pre-requisite for high yields, and nitrogen is mainly responsible for such a vegetative frame. 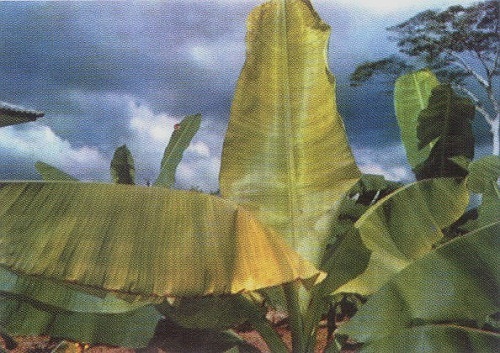 Banana plants, poorly nartured with N, produce only seven leaves versus 17 leaves produced by banana plants supplied with adequate N.
If N is deficient in bananas the leaves take 23 days for unfolding versus 10 days for the leaves of banana supplied with adequate N.
Nitrogen deficiency causes slow growth and paler leaves with reduced leaf area and rate of leaf production. N positively influences the longitudinal growth of petioles. It was observed that the greater the number of large, healthy leaves, produced during the first 4-6 months, the larger will be the size of the fruit bunch. Nitrogen increases the bunch grade, and sucker production. Lack of N produces thin, short and compressed leaf petioles, thin and profuse roots, and lesser number of suckers, .. Phosphorus uptake is higher due to N deficiency. ** - Fertilization: P and K, dolomite lime. N split (35, 75, 115, 155 days after planting). Function: Phosphorus helps to produce healthy rhizome and a strong root system. It also influences flower setting and general vegetative growth. 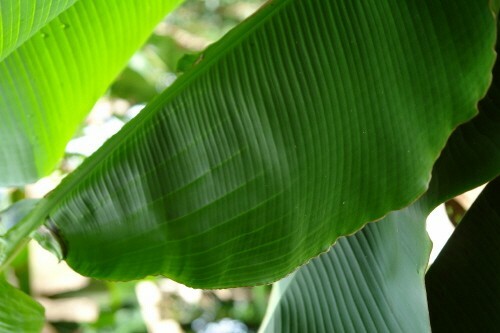 It is one of the three primary nutrients and is absorbed by banana roots mainly in the form of orthophosphate (H2PO4-). It is a component of sugar-phosphates, nucleic acids, nucleotides, coenzymes, phospholipids, phytic acid, and more. It plays a key role in reactions involving ATP. This element is necessary for many life processes such as photosynthesis, metabolism of carbohydrates, and the transfer of energy within the plant. It helps plants store and use energy from photosynthesis, develop roots, speed-up the maturity, and resist stresses. Deficiency Symptoms: Phosphorus deficiency symptoms show on the old leaves as chlorosis of their margins. Purplish brown flecks develop there as well. With severe deficiency, the affected leaves curl, the petioles break, and the younger leaves have a deep green color. 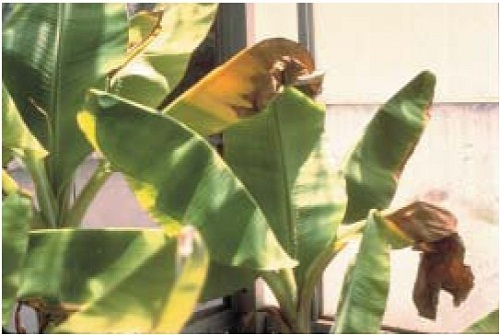 P deficiency causes complete cessation of elongation, at a height of about two feet rosetting of leaves with older leaves becoming increasingly irregularly necrotic, leaf production is reduced and marginal chlorosis and in severe cases premature death follows. Due to the very high K contents in the banana fruit and leaves (see Fig. 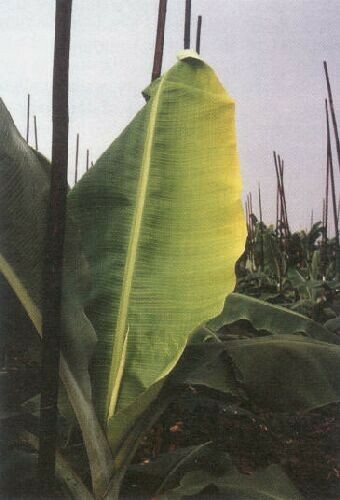 1, page 5) K is considered the most important plant nutrient in banana production. The amount of K taken up from the soil and removed from the field in harvested bunches is very high. Estimated annual soil losses through fruit removal alone can be 400 kg of elemental K (equivalent to 480 kg of K2O) per ha with a production of 70 tons of fruit. For this reason, banana requires a good K supply, even in soils where K levels are considered high. Function: Potassium is required as a cofactor for over 40 enzymes. It has a role in stomatal movements by maintaining electro-neutrality in plant cells. It is required for many other physiological functions, such as: formation of sugars and starch, synthesis of proteins, normal cell division and growth, neutralization of organic acids, involvement in enzymatic reactions, regulating carbon dioxide supply by control of stomatal opening and improving efficiency of sugar use, increasing plant resistance to biotic and abiotic stresses, such as: frost tolerance by decreasing the osmotic potential of cell sap due to higher ratio of unsaturated/saturated fatty acid, drought tolerance, regulation of internal water balance and turgidity, regulating Na influx and/or efflux at the plasmalema of root cells, chloride exclusion through selectivity of fibrous roots for K over Na, and imparting salt tolerance to cells by increasing K holding capacity in the vacuole against leakage when Na incurred in external medium. Potassium does not play a direct role in the plant’s cell structure, but it is fundamental because it catalyzes important reactions such as respiration, photosynthesis, chlorophyll formation, and water regulation. The role of K in the transport and accumulation of sugars inside the plant is particularly important since these processes allow fruit fill and, therefore, yield increase. Chlorosis of the leaves: The most characteristic symptom of plants lacking in K is the yellowing of the tip of the older leaves (Figs. 11 - 12). The yellowing and necrosis spread rapidly towards the leaf base, until the whole leaf has withered standing in a normal position. 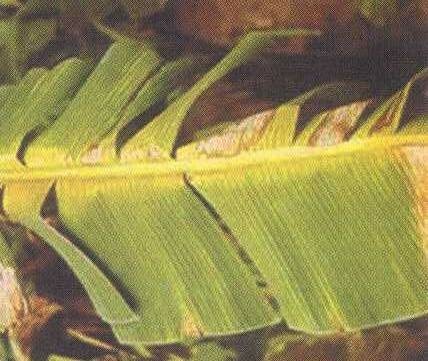 Rapid yellowing of oldest leaves, which then turn orange and dry-up; leaves may become tattered and fold downward; leaves are crumpled in appearance Splits develop parallel to the secondary veins and the lamina folds downwards, while the midrib bends and fractures, leaving the distal half of the leaf hanging. As time progresses, leaves curl inward and die soon after (Fig. 16). 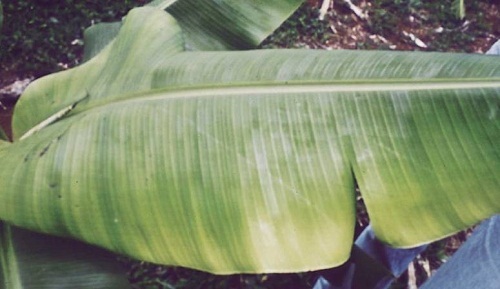 Figure 16: Potassium deficient banana; older leaves become chlorotic, then necrotic, and the tip of the midrib bends downward. 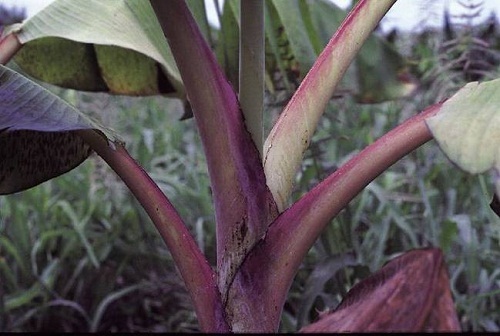 Purplish brown patches appear at the base of the petioles and in severe cases the centre of the corm may show areas of brown, water soaked disintegrated cell structures. Bunch deformation: fruit bunches on K-deficient plants are short, slim and deformed because of poor fruit filling, bunches are poorly filled. Fruits are badly shaped, poorly filled and unsuitable for marketing. Figure 17: Fruits are badly shaped, poorly filled and unsuitable for marketing. 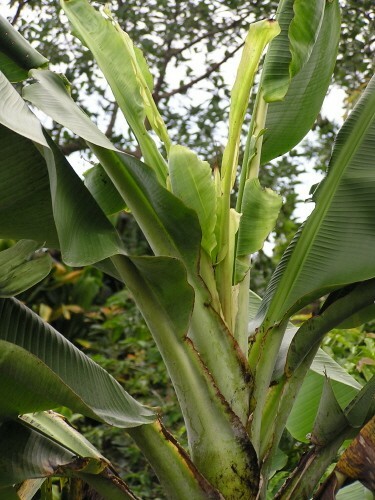 Stunted growth: It is common for K-deficient banana plants to exhibit slow growth, shortened internodes and a sturdy appearance. Longer than usual intervals between the emergence of new leaves, leaves are profusely smaller, premature yellowing of plant. Function: Magnesium is a secondary macronutrient absorbed as Mg2+. Magnesium is a crucial constituent of the chlorophyll molecule. It is required, nonspecifically, by a large number of enzymes involved in phosphate transfer. It is involved in photosynthesis, carbohydrate metabolism, synthesis of nucleic acids, related to movement of carbohydrates from leaves to upper parts, and stimulates P uptake and transport, in addition to being an activator of several enzymes. Deficiency Symptoms: Magnesium deficiency is expressed by yellowish chlorosis of the central zone of the lamina while the margins and midrib area remain green; other symptoms are purple mottling of the petioles and separation of leaf sheaths from the pseudostem. Function: Calcium is another secondary plant nutrients, absorbed by plant roots as Ca2+. Calcium is a constituent of the middle lamella of cell walls as Ca-pectate. Calcium is required as a cofactor by some enzymes involved in the hydrolysis of ATP and phospholipids. It is an important element for root development and functioning; a constituent of cell walls; and is required for chromosome flexibility and cell division. 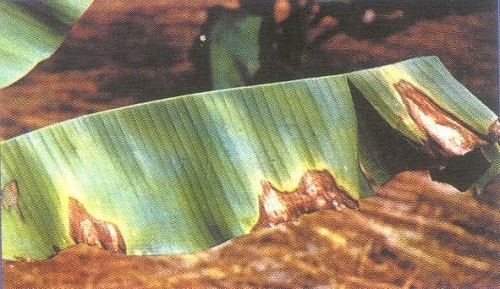 Typical symptoms indicating calcium deficiency in banana are: general dwarfing, reduced leaf length, reduced rate of leaf emission; leaves are undulated; tissue near midrib thickens, may turn reddish-brown. In sub-tropical growing areas, calcium deficiency, generally, appears in early summer after spring flush. It reveals as typical chlorosis and necrosis and “Spike-Leaf’ in severe cases. It causes heart rot to newly planted tissue culture plantlets. The fruit quality is inferior and the peel splits during the ripening. Function: Sulfur, also a secondary plant nutrient, is essential for protein formation, as a constituent of the three amino-acids cystine, cysteine and methionine. Sulfur is required for the formation of chlorophyll and for the activity of ATP - sulfurylase. These essential functions permit the production of healthy and productive plants, which are a precondition for high yields and superior quality. Leaves are chlorotic and reduced in size, with a thickening of secondary veins; undulating leaf edges; necrosis along edge of lower leaves. Below pH 5 there is a clear reduction in the uptake of Mo and P and an increase in the uptake of Mn and Al. Boron deficiency symptoms include: Chlorotic streaking of leaves, oriented perpendicular to and crossing the primary veins (Fig. 29); leaf malformation (Fig. 30), interveinal chlorosis. This deficiency can develop slowly over time. Boron deficiency may results in reduction in weight and size of the bunch and in proper filling of the individual fruit units. Boron deficiencies occur on a wide variety of soils, however, boron availability reduces as pH increases. Boron is essential for flowering, fruit set and the translocation of sugars. Boron is required for calcium uptake and movement, and calcium deficiencies can be significantly reduced by boron application. Boron plays a similar role to calcium in plant nutrition, which makes it essential for quality factors such as skin strength, fruit firmness and storage life. Because boron is required for root development and plant strength, deficiencies often increase the likelihood of fungal diseases and reduce the plant's tolerance to various environmental stresses. Function: Iron is a constituent of cytochromes, nonhaeme iron proteins, it is involved in photosynthesis, and N2 fixation and respiratory linked dehydrogenases. Iron is also involved in the reduction in nitrates and sulfates, and in reduction processes by peroxidase and adolase. Total amount of iron uptake by healthy plants is only about 1-3 g. 80% of this is absorbed during the first half of plant’s life. Deficiency Symptoms: General chlorosis of entire lamina mainly of young leaves; retarded plant growth; small bunches.Leaf color becomes yellow-white. Function: Manganese is one of the micronutrients, absorbed by the plant roots in the form of Mn2+. It is required for the activity of dehydrogenases, decarboxylases, kinases, oxidases, peroxidases, and non-specifically by other divalent cation activated enzymes. It is required for photosynthetic evolution of O2, besides involvement in production of amino acid and proteins. Manganese has equally strong role in photosynthesis, chlorophyll formation and nitrate reduction. A metallo-enzyme peroxidase concentration is considered to be the marker of Mn deficiency. 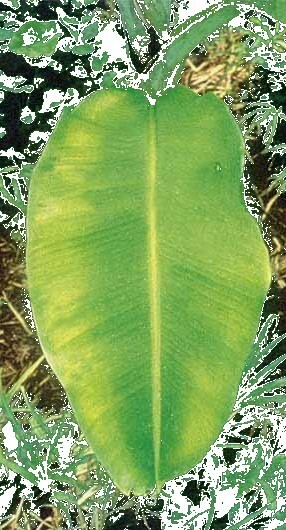 Deficiency Symptoms: Manganese deficiencyat its mild form is expressed as “comb-tooth” chlorosis, which starts on the leaf margins and spreads along the veins towards the midribof the leaf with occasional narrow green edge. Chlorosis first appears on second or third youngest leaf. 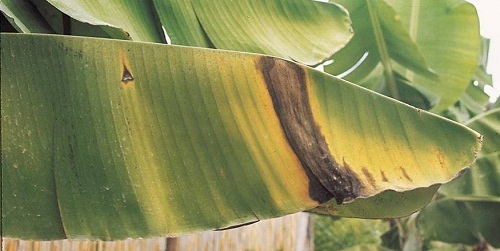 Figure 32: Manganese deficiency symptoms. Toxicity: Manganese toxicity is a known problem in acid soils. In severe cases, leaf Mn levels may reach 6000 ppm. Hi Mn levels reduce calcium uptake by 30%, magnesium uptake by 40% and zinc uptake by 20%, and may enhance the occurrence of disorder known as ‘mixed ripe’. Function: It is an essential constituent of alcohol dehydrogenase, glutamic dehydrogenase, lactic dehydrogenase, carbonic anhydrase (regulating carbon dioxide metabolism), alkaline phosphatase, carboxypeptidase, and other enzymes such as dehydropeptidase and glycylglycine dipeptidase active in protein metabolism. It also regulates water relations, enhances cell membrane integrity, and stabilizes sulflahydryl groups in membrane proteins involved in ion transport. Under low Zn availability bunch mass will quadruple in response to increasing Zn rate. At high concentration Zn features low mobility rate in the phloem from the leaves to the fruits. 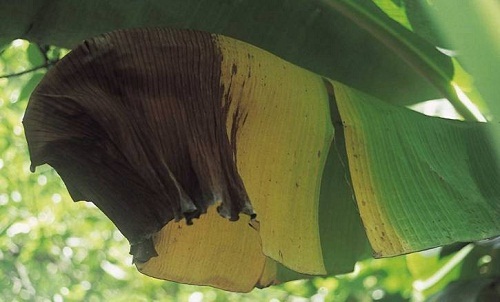 Deficiency Symptoms: Zinc deficiency is a very common problem in banana, observed in all growth regions. It is more common on young plants with no mother plant to act as a nutrient reservoir.Symptoms may appear in one year without affecting yield, but reduce fruit yield in second or third year. 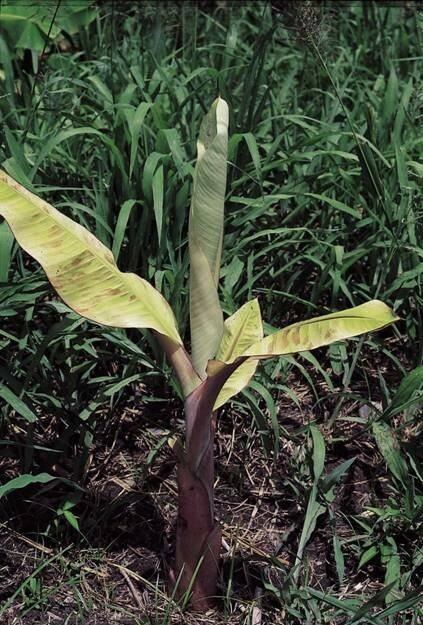 Zinc deficiency is found in banana when it grows in zinc-deficient soils, symptoms may be severe mainly in sandy soils and on high pH soils due to fixation, or on weathered, acidic soils, were Zinc content is low. Zinc may leach under acidic conditions. Also, zinc is inactivated at high concentrations of phosphorus in the soil. It shows as narrow pointed and chlorotic young leaves, strap-shaped leaves, leaf chlorosis in strips or patches;. A zinc deficient leaf is significantly smaller in size than a normal leaf and high concentration of anthocyanin pigmentation is developing on its lower side. Plant growth shows stunting and resetting. Function: Copper plays an active role in enzyme performing key functions like respiration and photosynthesis, and Cu-proteins have been implicated in lignification, anaerobic metabolism, cellular defense mechanism, and hormonal metabolism. Known forms of Cu in the plants comprise: cytochrome oxidase, diamine oxidase, ascorbate oxidate, phenolase, leccase, plastocyanin, protein having ribulose biphosphate carboxylase activity, ribulose biophosphate oxygenase activity, superoxide, dismutase, plant acyanin, and quinol oxidase. Copper proteins exhibit electron transfer and oxidase activity. Copper is also a constituent of cytochrome oxidase and heme in equal proportions. It also acts as a terminal electron acceptor of the mitochondrial oxidative pathway. Deficiency Symptoms: Midrib and main veins bend backwards giving plant an umbrella appearance. Leaves turn a yellow bronze color. Cu toxicity is possible, in particular where Bordeaux mixture is still in use for plant protection. High salt levels in soil or water can cause stress. Salinity stress results in marginal leaf chlorosis, stunted growth and thin, deformed fruits. Dessert bananas of AAA type (e.g. Cavendishs) are more sensitive than plantains (AAB/ABB types). 100-500 ppm total soluble salts in soil is satisfactory with banana growth. At levels of 500-1000 ppm, plants and fruits are visibly affected. When total concentration of soluble salts exceeds 1000 ppm, plants are stunted or dead. Salinity problems occur in Carribean area, Latin America, Israel, Canary Islands. Bananas seem to be more sensitive to Na than to Cl. (E.g. bananas still grow at up to 600 ppm Cl in irrigation water) (Israel). At high Na levels, Na contents in roots can rise up to 1.5% (3 x normal value), especially when K is deficient. - Na (or Mg) present at high amounts in irrigation water, reduce K uptake, even if soils contain high K levels. - High Na and Mg also reduce uptake of micronutrients. When Cl is excessive - sucker growth is restricted and fruit will not fill. 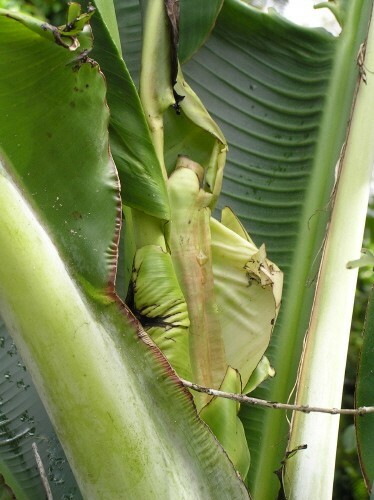 Salinity damages start showing in banana plants irrigated with water at a concentration of 500 mg Cl/ L. The problem escalates when recycled irrigated water is used. In such case, the use of Multi-K™ potassium nitrate as a source of nitrate to suppress the uptake Cl by banana roots, is recommended. 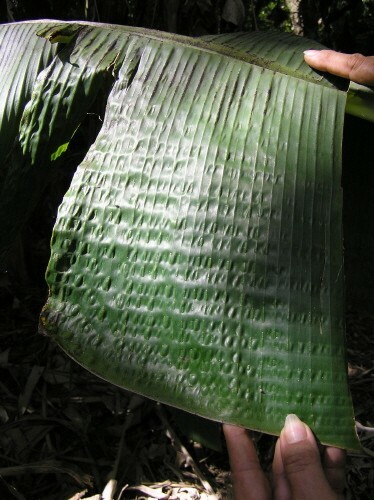 The effects of salinity (0, 50 and 100 mM NaCl) can be observed on many banana cultivars. 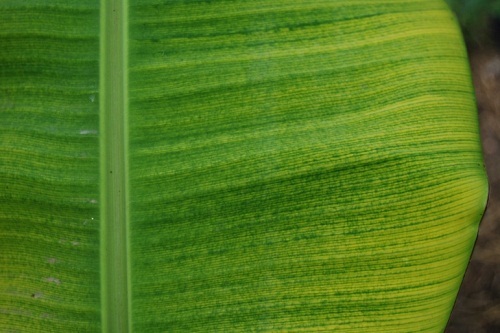 With increased NaCl levels it shows injury symptoms, such as: chlorosis and marginal leaf necrosis with subsequent leaf death. The effects on leaves results in the reduction of up to 50% of leaf area and and 70% in dry matter. Increased salinity in the irrigated water reduces yield (Figs. 37 - 40). 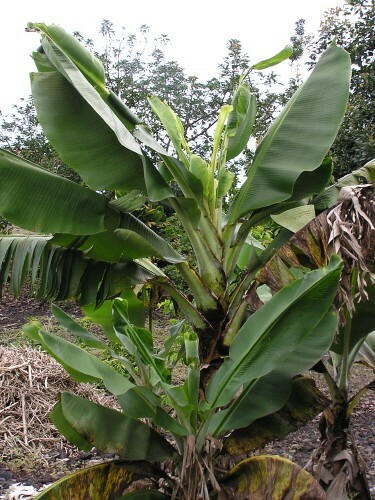 As a result to the fact that banana plant is sensitive to salinity, the source of fertilizers, as a potential contributor to salinity, should be selected carefully. Haifa's fertilizers are products of choice as a chlorine free source, either water soluble fertilizers or CRF (Controlled Release Fertilizers). For more details, see pages 60-70.